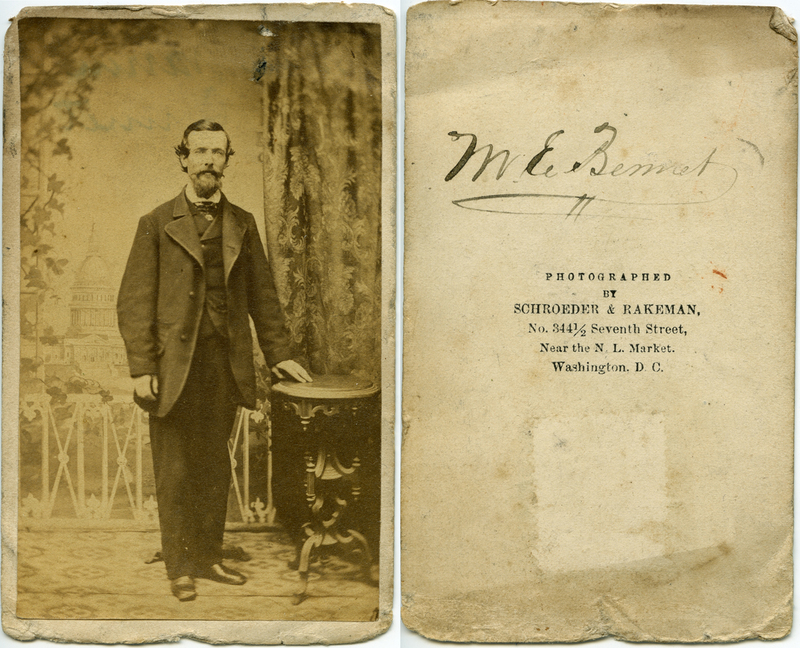 Another little CDV added to the collection, from Schroeder & Rakeman, 344 1/2 Seventh Street. It’s nice to find an image that is identified, even if the subject remains anonymous after the naming. I’ll have to do some digging around to find out who this might have been. Obviously the photo was made post- civil war, as it shows the dome of the US Capitol completed in the painted backdrop. I did look up a map of Washington DC from the 1850s to see if I could find the ‘N.L. Market’ referenced in the photographers’ back stamp. While the building (or place – the market could have been a permanent outdoor location), the address is part of what is now called the “Market Square” office/condo complex, including the Navy Memorial. Another option for the studio would be at 344 1/2 Seventh Street, SE. Which ironically enough puts it within a block of Eastern Market. I can find no reference to Eastern Market as anything other than Eastern Market, however, which throws this location for the studio into doubt.